The Persian Leaps began as a phrase singer/guitarist Drew Forsberg doodled in a notebook during a college Greek Archaeology course. He wrote music independently under that name for years, until finally assembling a full band in 2012 to perform and record driving, chiming music influenced by My Bloody Valentine, The Smiths, Guided by Voices and Teenage Fanclub. Can you remember the moment that you decided to be a performer? I have read that your mother was a musician. That must have influenced you, right? DREW FORSBERG: I can’t remember a specific moment but I wanted to be in a band from 7th grade on or so. My mom and her mom are/were both musicians, so music was a big part of my life growing up. I have read that The Persian Leaps began when the front-man doodled in a notebook margin during a college Greek Archaelogy class. How did that all happen? What does Persian Leaps really mean to you? I’m a recovering archaeologist. I studied it in college and then went on to get a Master’s degree and work in the field for some years. But it was a lot of travel and it was hard to have a home life–or start a band! 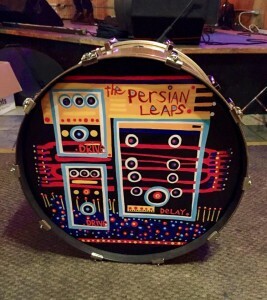 The band name comes from a line in poem I wrote in a notebook in college: “The Persian leaps from his chariot.” The poem was dumb, but I liked the sound of that opening phrase and always thought I’d name my band the Persian Leaps. It doesn’t have any deeper meaning, but I do like how it sounds. And it ties nicely with my past as an archaeologist. What made you decide to start a band in 2012? I had been writing and recording songs in my bedroom for years–even putting them on tapes or CDs labelled “The Persian Leaps” but not actually sharing them with more than a handful of people. Back in 2010 or so, I started a different band with 2 other friends where we played some originals, plus covers, and we all switched around on instruments quite a bit. It was really fun but the band fizzled out. I sat around moping for a year or so and really, really missed it. Then I met Mike, our drummer, and another friend and we started a band that would split and then evolve into The Persian Leaps. It’s been incredibly rewarding and satisfying to see the band become a reality. Your sound has been described as ‘Noise-Pop’. Can you elaborate on what that means exactly? There’s an annual festival (which I’ve never been to) in San Francisco called Noise Pop. That’s where I first heard the term. Our songs are all very much pop songs–an emphasis on hooks, short and to the point. But I really like using a lot of guitar effect pedals, with a lot of fuzz or distortion. So, the songs are pop, but they’re generally pretty noisy, too. We aren’t shoegaze, but we seem a little too noisy to be called power pop (although I’ve seen reviews where both terms come up). Noise pop seems like an apt description to me. Not everyone agrees with the classification. “Rock” works, too, if it comes down to it! How do you think you and the band’s sound has grown over the years? 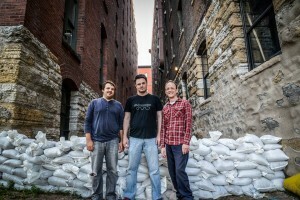 How is the band’s latest EP released Drive Drive Delay different then Praise Elephants? Most of the songs we’ve recorded so far are from the same vintage. We’ve been playing them live for several years now. So, the songs themselves didn’t change but the production definitely did. We self-recorded the first EP in a dining room in rural Minnesota and then took the tracks to Neil Weir at Old Blackberry Way in Minneapolis to clean them up and mix them. With the new EP, we knew we wanted to work with Neil and record everything at his studio. So, the sound on the new EP is much better. And of course, we’re more confident than we were and have gelled as a band. I’m constantly seeking out and listening to new music, but the influences always come back to the bands that I grew up on: Guided By Voices, The Smiths, My Bloody Valentine, Teenage Fanclub, Echo & the Bunnymen, The House of Love, Jesus & Mary Chain, and so on. Throw in a little power pop, post-punk, and UK first-wave punk, too. It’s hard to imagine those bands not continuing to have a major influence on our music. I’m a huge Guided By Voices fan. Working with Robert Pollard would be amazing, although I have a feeling we’d end up playing his songs and not ours. Do you guys have plans to tour outside of MN soon? We don’t, really. We all have families, careers, and/or mortgages, so it’s just not feasible to hop in a van and hit the road for weeks at a time. Maybe something will come up where we’ll play outside of MN, but it would be hard. Honestly, I spent years touring around the Midwest in a van as an archaeologist. It was fun for awhile, but that lifestyle is a good part of why I switched careers and got into web development. The weirdest thing we’ve done as a band so far was the filming of our video for “Pretty Boy” last summer. The director had the idea to shoot it in this restored prairie at sunset, so we hauled all our gear up a hill, wading through long grass, and then filmed for a couple hours as the sun sank down. After we finished filming, we had to haul out our gear in the dark. Towards the end, the mosquitos were so bad we wanted to cry but it was worth it. Presumably. A deep compulsion to listen again. What do you think has been the band’s biggest accomplishments so far and what do you hope to happen in 2015? The EPs are our biggest accomplishments. We’re just focused on pacing, sustainability, and quality with our recorded material–and in general, as a band. Our plan is to release a 5-song EP every year. Each winter, we’ll record the 5 absolute best songs we have that work together and then release them on an EP the following fall. We’ve already started the process over again and have one new song recorded. Look for a new EP this fall!